On Making Coal Mining Safer, Or, "It's The Fines, Stupid!" By now more or less everyone is aware that there has been a disastrous mining accident in West Virginia this week. There are many people dead, and at the time this is written it is still possible that survivors might be found. We don’t know much about why these disasters happen, for the most part, and we don’t really understand how to make things better. Today, I’m here to fix some of that. By the end of today’s story, you’ll understand a lot more about why people die in mines than you do now-and as an extra bonus, we’ll also discuss a radical new way to bring market forces into the process of making mines safer. As so often happens, we’re going to need to cover a bit of background: a bit less than half of coal mined in the US is found underground, and no matter how you go about it, mining coal is pretty frightening. The “room and pillar” method of setting up a mine sounds like what it is: you clear out a large underground space, but you leave “pillars” of unmined ore to support whatever might be above, which could be additional levels of “rooms”, or it could be the mountain itself-but it’s most likely to be both. “Longwall” mining involves removing far more material than room and pillar mining, and to make that happen the roof immediately adjacent to the mining equipment is braced. Eventually that bracing is removed and the roof is allowed to collapse behind the miners as they leave the mined space. If you can picture a five foot tall, 20 foot wide, spinning cylinder with giant teeth that can move up and down, attached to a low-slung tractor, you have a pretty good idea of what the continuous mining machine that’s used in room and pillar environments looks like. Longwall machines have a spinning head that travels the length of the wall being mined; as a result these machines can be hundreds of feel long…or across, if you prefer. The mines are accessed by different types of “shafts”. Some shafts are drilled diagonally into relatively shallow mines. 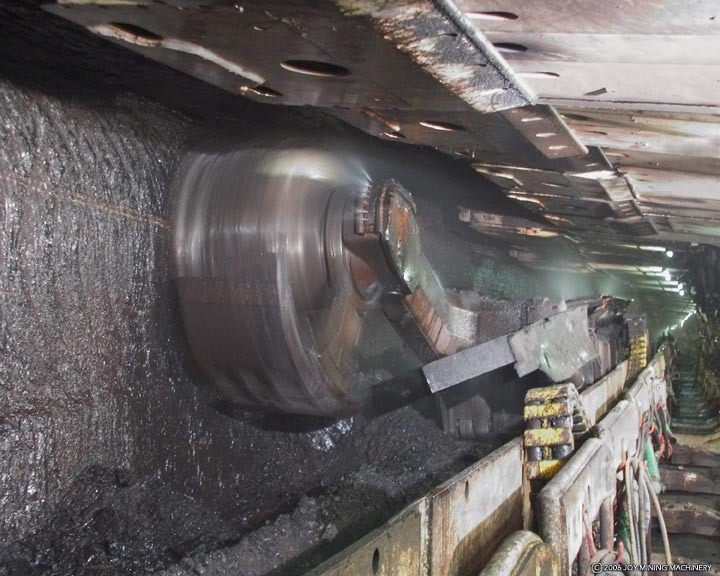 Deeper mines are accessed with vertical shafts, which can reach down 2000 feet or more; additionally, there are conveyor systems, sometimes miles long, that move the ore up to the surface for processing. The first problem is dust. Coal dust is highly combustible (and the smaller the dust particles in any given volume of air, the more explosive potential exists), and there are lots of ways to create it: the mining machines create clouds of dust as they attack the walls, the conveyors carry dust through the mine, and vehicles stir up dust on the floors, to name just a few. Once the dust is in the air, in sufficient quantity, any spark could cause an explosion-and just operating the machinery in the mine creates lots and lots of sparks. The region of the country, oddly enough, has a lot to do with how much, and what size, of dust you’ll be dealing with in your mine, and mines in each District under the Mine Safety and Health Administration’s (MSHA) jurisdiction have their own particular dust characteristics. It’s possible to monitor the air, in real time, and there are devices that measure how much explosive potential exists in the rock that’s in the chamber with the miners. Coal dust can be controlled, first, by mixing it or covering it with other nonexplosive dust (finely ground limestone is often used for this purpose), and by getting water on the dust to keep it out of the air. There are all kinds of considerations that determine how well “wetting” the ever-present dust clouds will work, including the surface tension of the liquid, droplet size, dust size…well, anyway, it’s a complex business, and the results have been pretty hit-and-miss. There is good news: an experimental “water curtain” system is now coming into the field that offers the potential to reduce dust to 50% of the levels seen with today’s systems. Oddly enough, no one thought, for the longest time, that dust was even a hazard-until November of 1963, when the worst known mine disaster in history killed 1,197 workers at Japan’s Miike coal mine. Methane is the second big hazard. Concentrations above 5% are dangerous, and MSHA limits acceptable methane levels in the mines to 1%. The risk, as MSHA succinctly puts it, is from “frictional ignitions”, just as it is with coal dust. You’ll notice methane actually causes two problems: it can kill you if it blows up-and even if it doesn’t, just the presence of enough methane in the air can kill you. The very imperfect solution here is ventilation-but the “forced air” ventilation requirement can be reduced considerably through the use of boreholes and “bleeders” to vent methane away from work areas using natural drafts. The third reason people get killed in mines has to do with “geography”. What I mean is that, instead of an explosion, the mine either caves in or floods; the one usually caused by removing pillars unsafely, the other sometimes caused by hitting unexpected pockets of water (the Quecreek Mine in Pennsylvania was flooded in just this way). So here’s the thing: making life safe in this amazingly dangerous environment is amazingly expensive, and the common wisdom has been that if you’re running a mine it’s probably cheaper to let the MSHA folks levy a few fines-and to let a few miners die-than to really do what needs to be done to protect those workers. nsafe behavior-a mountain so large that sometimes even Fox News feels compelled to weigh in on just how bad things have become. And that’s how we get to the “proposal” part of my proposal. Now I know this is going to sound obvious: but if it’s cheaper today to violate the rules than it is to comply…well, why not make it more expensive to violate the rules than to comply? Here’s what I mean: If a mine is missing a piece of safety equipment…say, the amount of ventilation is found to be insufficient…and the cost to mitigate the problem is $100,000…then let’s set the fine at $150,000, per day, per occurrence. If it becomes known to MSHA that the new water curtain system is the best way to go, mandate that it be adopted-and once again, set the fine for failure to comply at 150% of the cost of compliance. Now here’s the good part: we do not have sufficient personnel at MSHA to inspect all these mines…but we do know how to get those folks out there, and how to fund them, all thanks to the War on Drugs. Travel through Texas, or Florida, or Tennessee, and you may very well find yourself being pulled over by a cop who basically earns his living shaking down those he is able to catch with drugs. Seizures of cars and cash are the motivation here, and many of the drug task forces (as well as quite a few “traditional” law enforcement agencies) are highly dependent on this type of funding. As you might guess, this creates…aggressive…officers, who are hustling, like crazy, to bring in all the income they can. Well, I thought to myself, why not apply the same model to mine safety enforcement? Why not create a “Mine Safety Task Force” that would be empowered to enter and inspect any mine at will, would be free to find each and every violation that might possibly exist-and who would have a financial stake in finding and fixing violations? Now you might say to yourself that this could create people who cause way too much trouble for the mines-but if your father or brother was lying dead in that mine…if maybe you were next…would you think maybe causing mine owners some trouble they have never had before might be a pretty good idea after all? In addition to fines, there should be mandatory mine closures (with the mine providing pay to workers during the closure) for particularly egregious violations, or for patterns of the same violation over a long period of time. It makes the Power Of The Free Market into an enforcement tool, as it’s no longer cheaper to violate safety rules than it is to obey them…and what Good Conservative Mine Owner wants to tell America, out loud and in public, that they no longer believe in the free market? So there you go: we now understand why these accidents occur, and we now have a plan that makes it too expensive to kill workers as a cost of doing business, which is a huge change from what we seem to be doing now. …if we don’t have to?